Love the ice cream cone mini from the summer release. Simple circles and ribbon make for a quick 'just catching up" card. I added bling for sprinkles....looks almost good enough to eat, doesn't it. 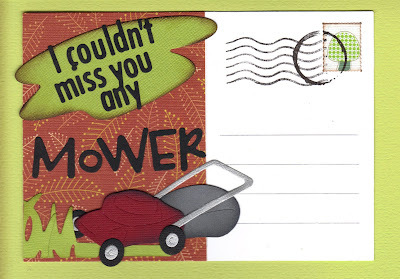 Fun play on words here with the lawn mower. LOL I love punny phrases! These cards are adorable! I love the chicken! Too cute!!!! Celeste - I made up the phrase and just printed it onto the shape. I thought is was pretty cute, if I do say so. LOL Thank you! Sooooooooooo much cuteness today!!! Great projects, Shar!! These are all great, puns and all!